I hope you'll stop back again soon. Awesome!! 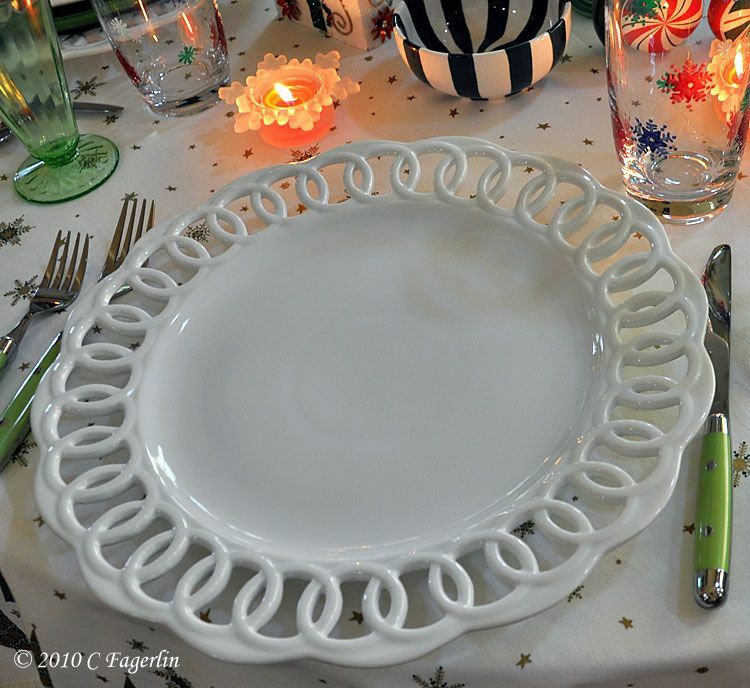 I especially love the white milk glass chargers! 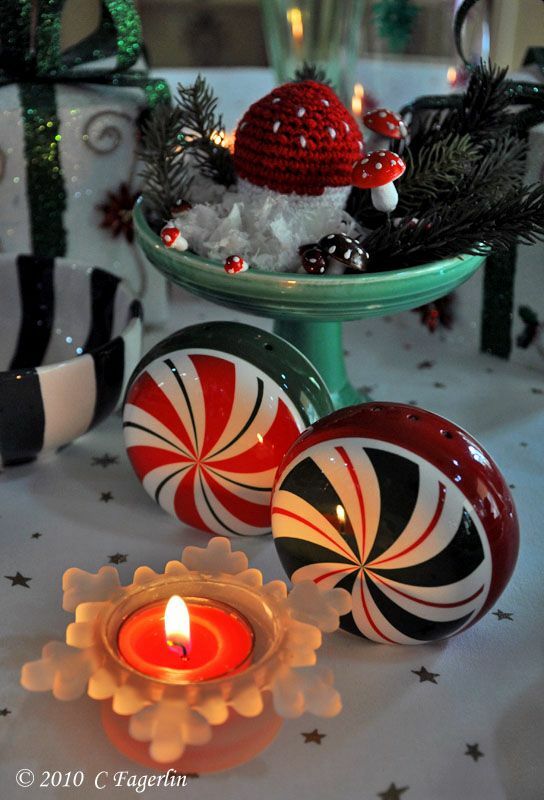 Lovely, Candy! 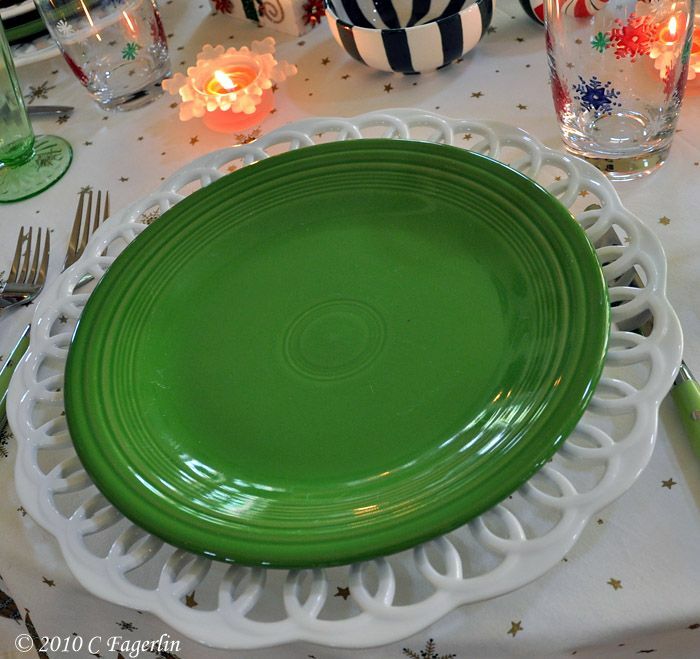 The comport centerpiece is especially charming! Love those white chargers!! Everything is so pretty! 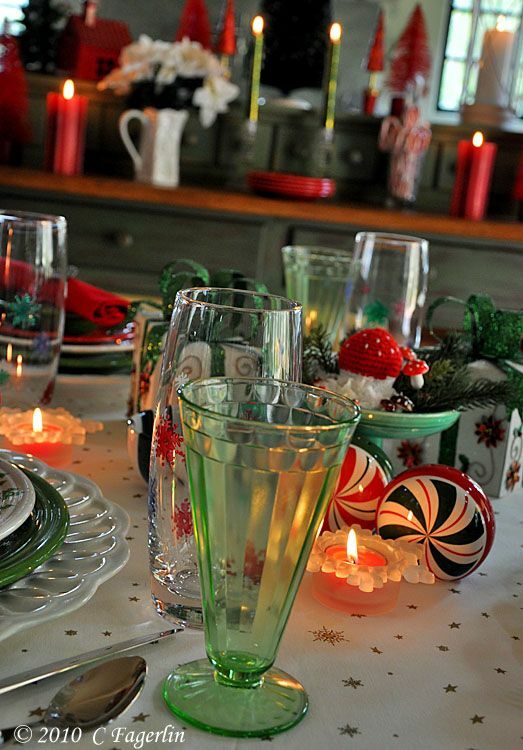 Everything is is so pretty and festive! love the chargers! 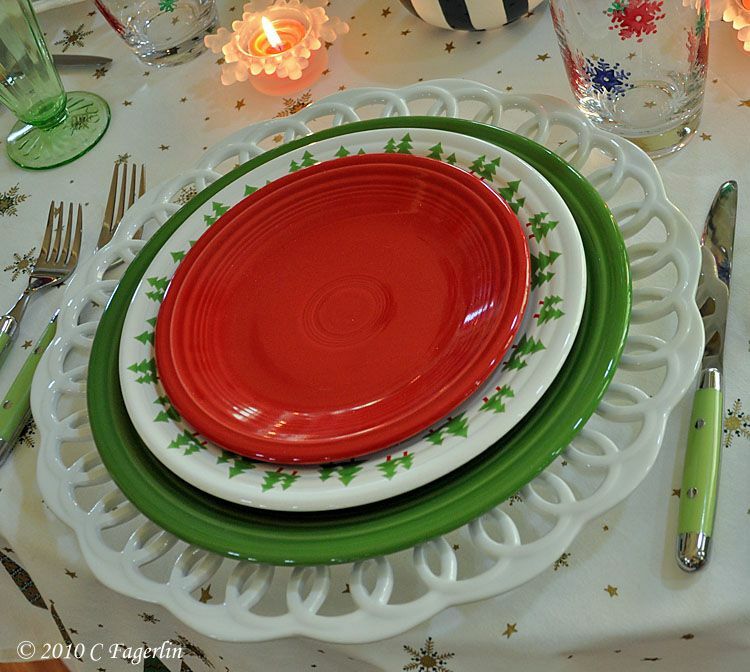 Oh you do have the most fabulous dish collection! 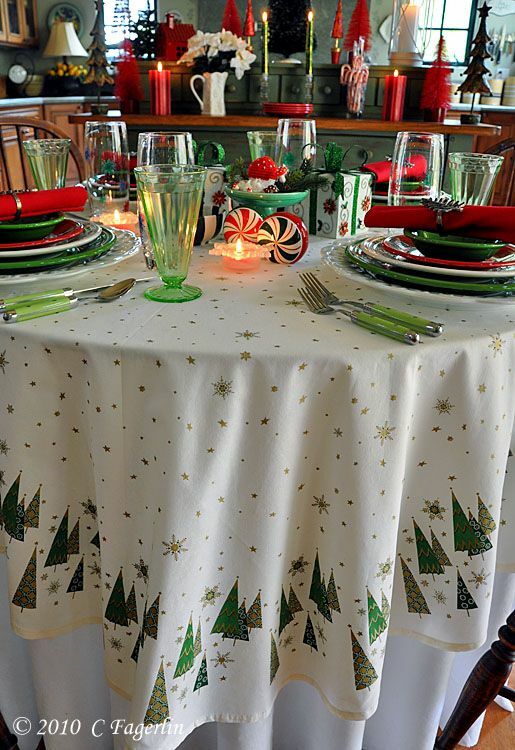 Love all your wonderful tablecloths too. 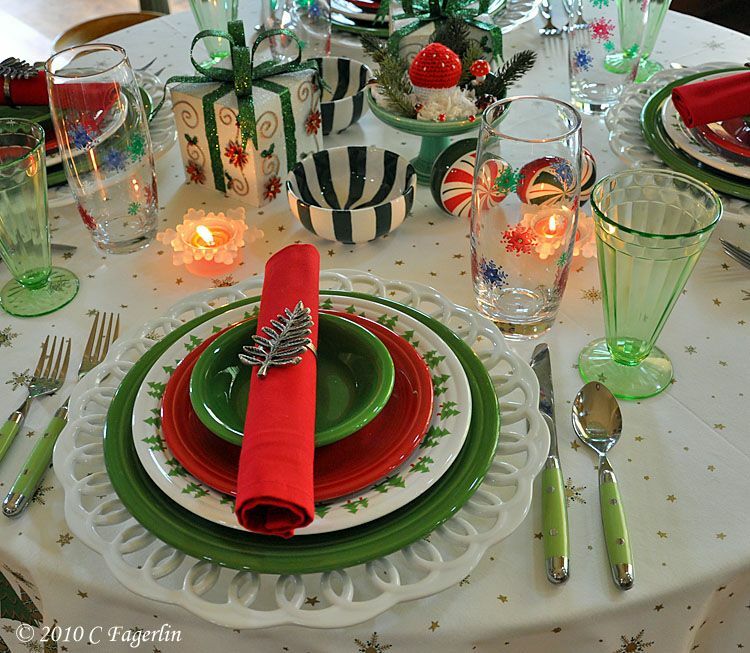 Oh this table setting is so wonderful and so cheerful ~ who wouldn't be smiling sitting at this table! I always look out for your posts! 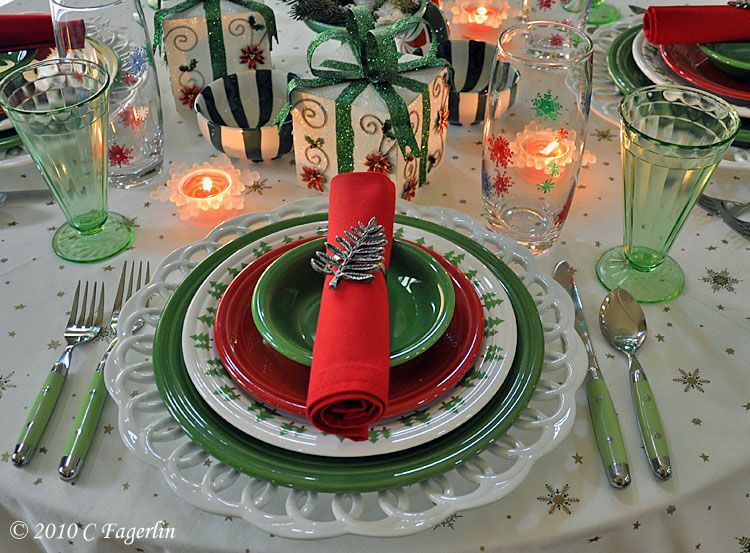 Love the kitchen, the table, of course - the Fiestaware! My favorite thing about your beautiful kitchen is the "space". It's just wonderful. 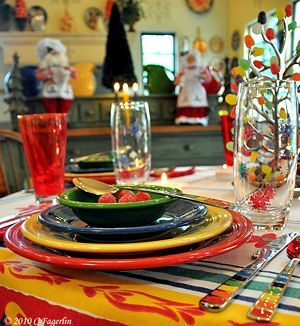 I love the way you create such wonderful table settings, you must have an enormous china cupboard to hold all your dishes! 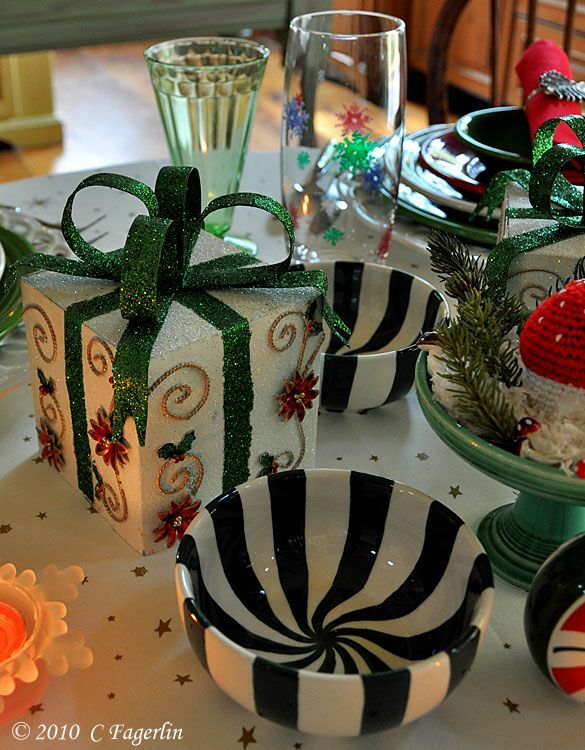 The gift boxes in the centre of the table are gorgeous. 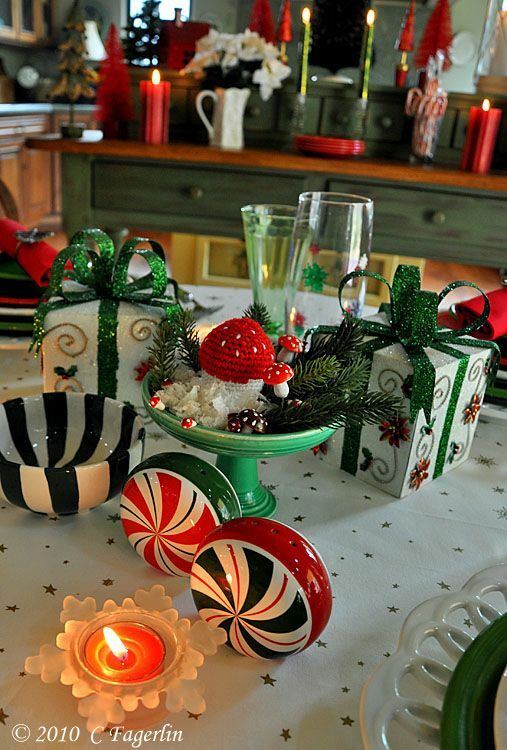 Candy, what a beautiful table!! Every element is fabulous! 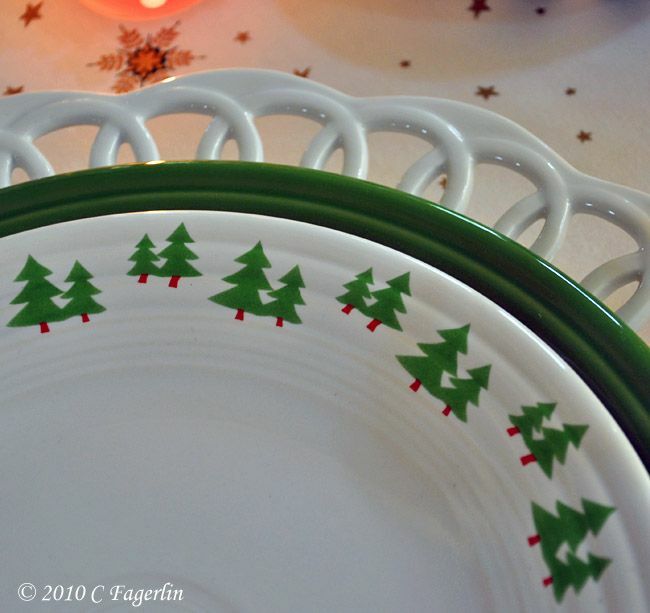 I LOVE the tablecloth and the Christmas tree dishes! 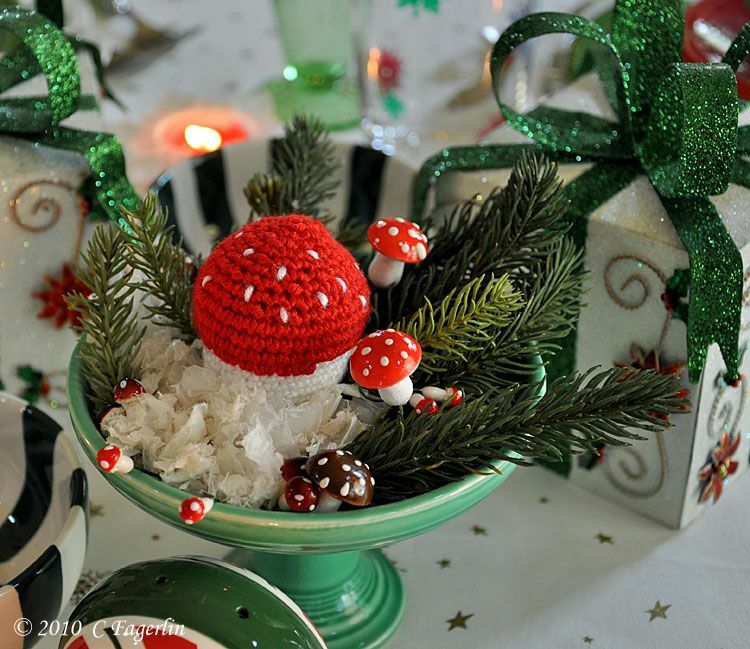 the little crocheted mushrooms are sweet and the gift boxes are beautiful! 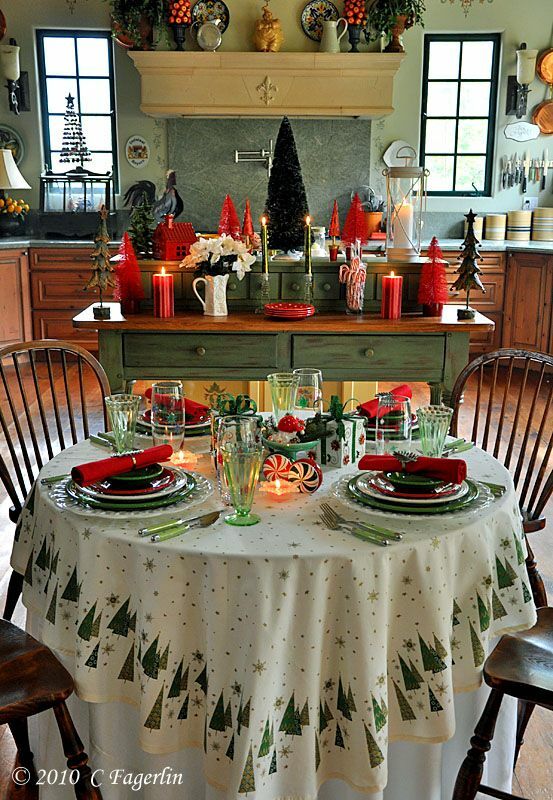 You have absolutely captured Christmas!! 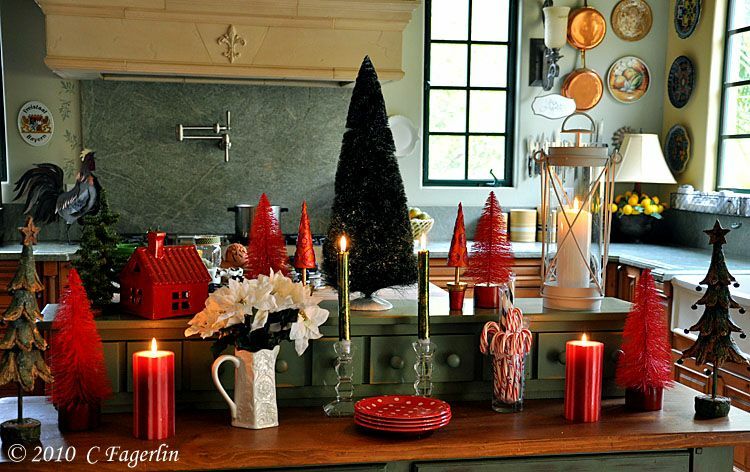 Candy, this is the prettiest Christmas kitchen I've ever seen. Everything is just perfect and I can see you must have had a blast, putting this all together. 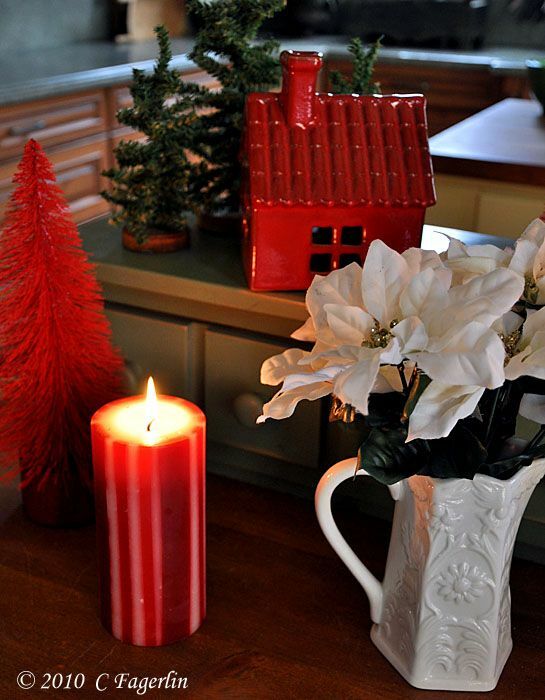 I think your kitchen, as a whole, is one of the warmest and prettiest kitchens I've ever seen. The warmth and personality just jumps out at you. I love everything you do!! Thank you all for coming by to visit again! 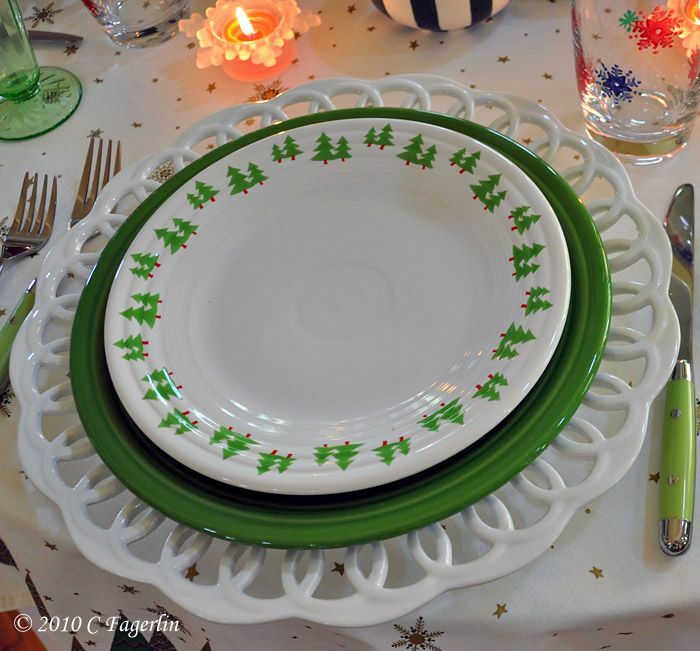 Most of my tablecloths are vintage, but this one happens to be a Martha Stewart one from a couple years ago. 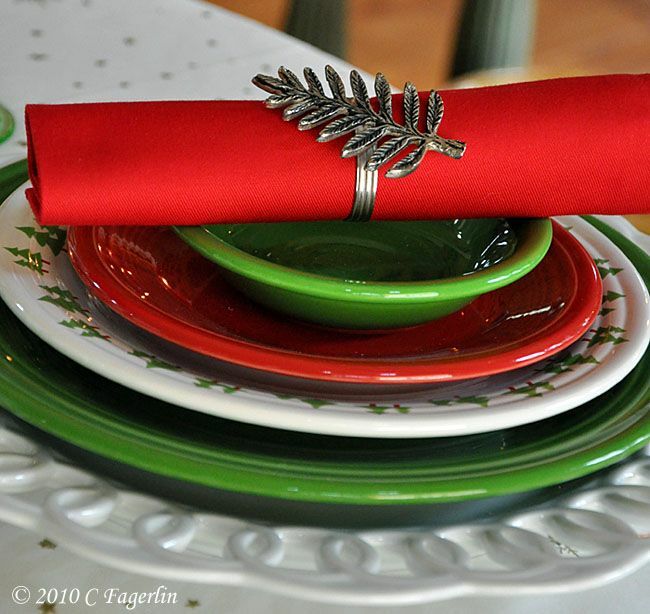 She adapted quite a few tablecloths from vintage inspiration pieces, so I think it does give a vintage look to the tablescape. 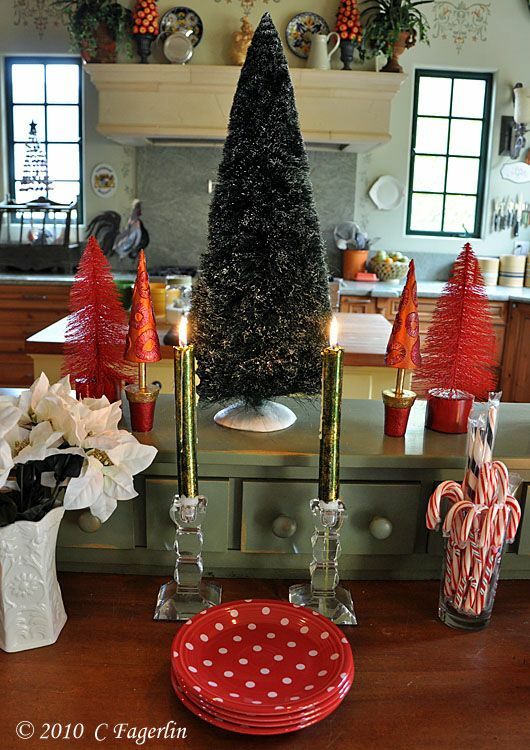 Thanks Laurie and Happy Holidays! 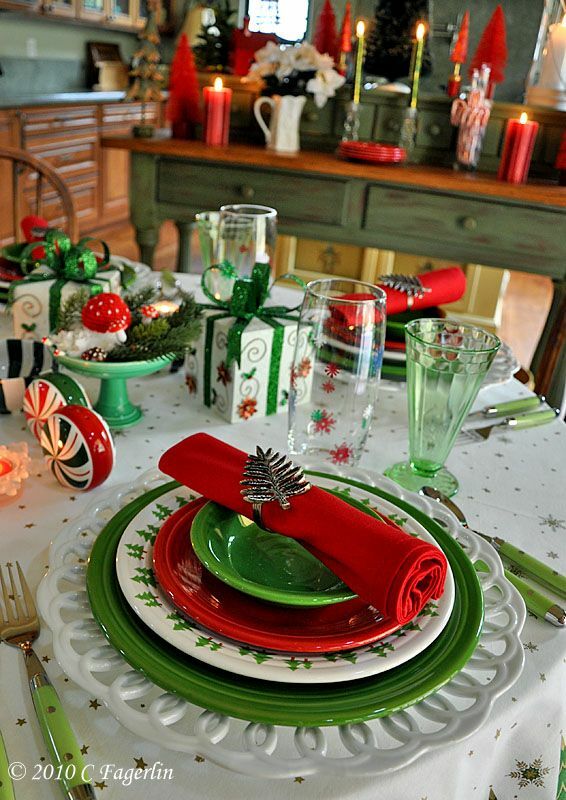 This is my favorite of your Christmas tables so far!!!!!!!!!! 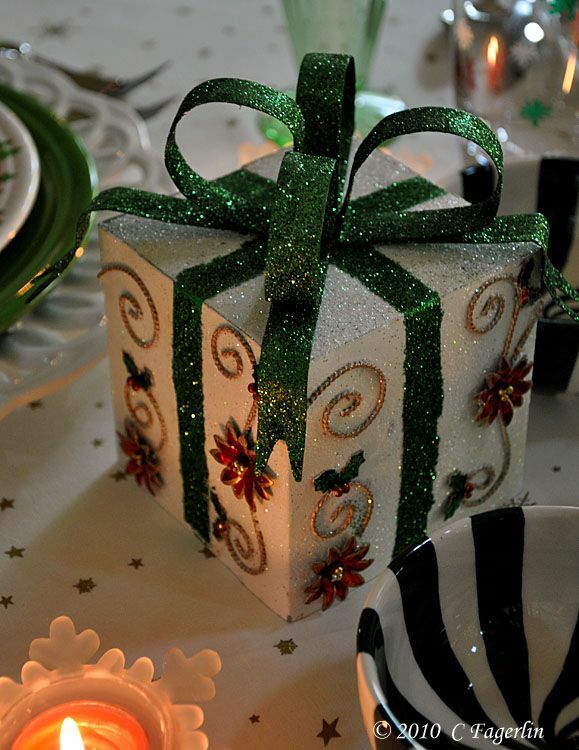 I just LOVE those little boxes!!!! 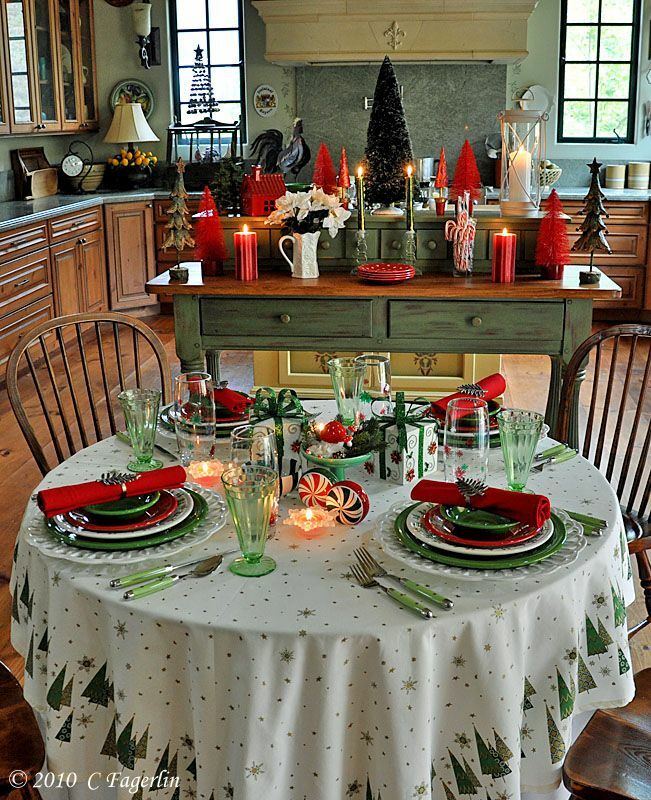 I can't believe I haven't had a minute to post a Christmas table yet, but don't count me out, they WILL appear!!! 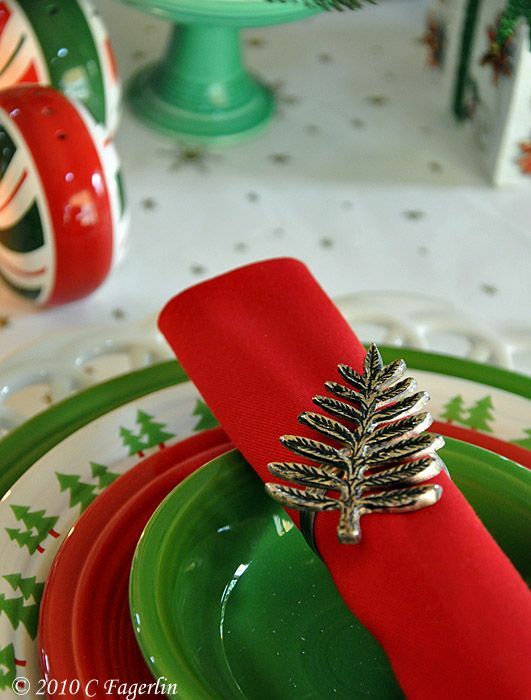 :):) The S and P's are adorable too and the napkin rings!!!! 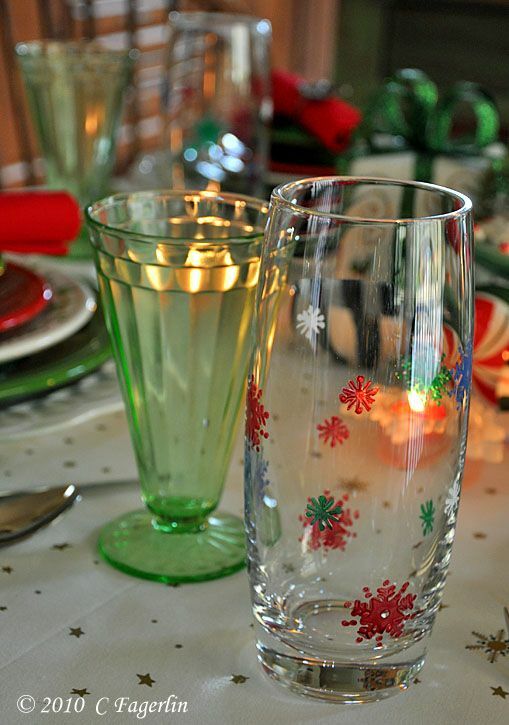 I also love these glasses! Please stop by soon. XO, Pinky PS, you know how much I LOOOOVE your kitchen! Thanks Pinky, so glad you enjoyed your visit!